Between 5700 and 2800 BC, Neolithic Cretans lived in caves or basic houses. These people were hunter-gatherers who also farmed and raised livestock. The Minoans arrived in Crete in about 3000 BC from North Africa or the Middle East, bringing with them the skills necessary for making bronze. The Minoans thrived, as their use of bronze allowed them to build better boats and thereby expand their trade opportunities. Around 2000 BC they built their first palaces of Knossos, the palace of Faistos and the palace of Malia and improvements in technology allowed them to produce fine pottery and jewellery while . 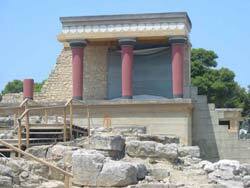 The Minoans became the first advanced civilisation to emerge in Europe. The "golden age" of the Minoans was from 1700 BC to 1380 BC. Palaces destroyed by a natural disaster in 1450BC- probably resulting by a volcanic eruption at the island of Santorini - brought Minoan civilisation to an abrupt halt. 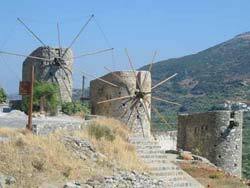 Crete then underwent over three millennia of occupation by various forces. First were the Mycaeans from the mainland (1400-1100 BC), then came the Dorians, also from the mainland (1100-67 BC), although this period saw almost constant warfare between Crete's city states. The Romans took over in 67 BC; in 27 BC Gortyn (present-day Gortyna) became the capital of (and most powerful) city of Crete. When Rome's power declined at the end of the 4th century AD, Crete became part of the Byzantine Empire and was ruled from Constantinople (Istanbul). The Arabs conquered Crete in around 824; the Byzantines reclaimed it in 961 and sold it to the Venetians in 1204; it fell to the Turks in 1669 and became part of the Ottoman empire; it was given to Egypt in 1830, and returned to the Ottomans in 1840. After a series of rebellions the Ottoman occupation is over in 1898, which was then ruled by an international administration. 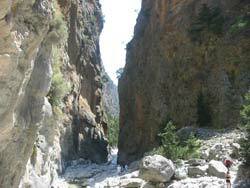 Greece and, in particular, the world powers of the time resisted Crete's desire to be unified with Greece until 1913. By 1935 a rigged plebiscite put King George II on the Greek throne. He promptly named Metaxas prime minister, and then turned a blind eye as Metaxas went down enforcing dictatorship in the guise of protecting the nation from communist forces. Metaxas had a grandiose vision of a Third Greek Civilisation rising from the ashes of its Byzantine past, but what he created was more Hitlerian than Hellenic: opponents were exiled or imprisoned, trade unions were banned, the Greek Communist Party was gagged and fascist youth organisations were encouraged. On 28 October, 1940, when Italian dictator Mussolini demanded that Greece should allow Italian powers to occupy strategic defence locations within Greece, Metaxas refused. As a consequence of the refusal, Italy invaded parts of Greece. Later Germany conquered the whole of the country but not before the heroic Battle of Crete on the morning of 20 May 1941. The Battle of Crete was unique in three respects: it was the first-ever mainly airborne invasion; it was the first time the Allies made significant use of intelligence from the deciphered German Enigma code; and it was the first time invading German troops encountered mass resistance from a civilian population. In light of the heavy casualties suffered by the parachutists, Adolf Hitler forbade further large scale airborne operations. However, the Allies were impressed by the potential of paratroopers, and started to build their own airborne divisions. The end of the WWII in 1945 found the people exhausted and the nation in pieces. From 1946 to 1949, the country is led to Civil War. Despite the efforts to restore stability, the island gets caught up in the subsequent Colonel Coups of 1967 that will end in 1974. Postwar politics in Greece resulted to the creation of a series of political parties of various ideological backgrounds. Greece had a smooth transition to the euro in 2002, a successful EU presidency in 2003, and successfully hosted the 2004 Athens Olympic Games. 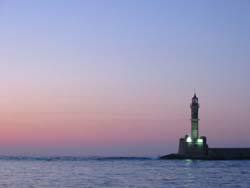 Due to this period of peace and also due to its favourable climate, the island of Crete became one of the most prosperous areas of Greece with agricultural products becoming a mainstay of Cretan economy.